Every first weekend of March, EGLSF holds its Annual General Assembly. This year was at The Hague, a city where 20 years ago the federation was born. It covers most of the LGBT sports clubs in Europe and it decides the future sites of EuroGames. Members of the Organizing Committee of the EuroGames Barcelona 08 attended and in front of around 130 delegates, presented the financial results of the 2008 games. Joan Miró, president of EuroGames Barcelona 08, explained the philosophy behind the games and reviewed the highlights of the games, the involvement of the municipality of Barcelona and the Catalonia Government, the relationship with other associations, the conference on human rights, the Village at Maria Cristina, the opening and closing ceremonies, the festival of women at the Poble Espanyol, the great EuroGames party at the Forum, and of course, the 25 sports which involved 5,314 participants from 37 European countries and represented 121 sports clubs. Also he outlined the publicity campaigns in conjunction with TMB, the campaigns with StopSida and BCNcheckpoint for the prevention of AIDS, and their impact on the media and press. But the final evaluation came directly from the participants themselves, who answered to a survey that was conducted just after the EuroGames and rated their general view the games -- giving a score of 6.86 points out of 10. At the closing ceremony of the 08 Barcelona EuroGames, we were reminded that not all gay, lesbian, bisexual, and transgender citizens in the world can live openly. That was the end of 4 days of sport, sun, fun, relaxation, debate, parties, exhibitions,…. Everything you could expect from an event as important as EuroGames. First of all we’d like to thank all of you who came South, who made the trip to Barcelona and enjoyed EuroGames 2008, in Southern Europe for the very first time. Participants, Supporters, Officials, Referees, Friends, Volunteers,… Thank you very much!!!! We’d also like to thank from the bottom of our heart all the volunteers,… not just from Barcelona, but from all corners of Europe, the guys and girls who wanted to help us make EuroGames possible. There were more than 1,000 volunteers in total, offering their precious time, abilities, friendship,… and always with a big smile. Again Thank you!!!! Of course we also want to thank all the sponsors, public corporations, individuals, partners, and organizations who gave us their support, not only financially (which is important) but also with their professional commitment. And finally our thanks to the Organizing Committee and the Staff. They have been the heart, soul, and hands of this complex body that is EuroGames. Their work was essential for the rendition of the Barcelona EuroGames. We have tried to meet everyone’s expectations, but we know that this is not always possible. Our goal was the satisfaction of all the athletes, supporters, and volunteers and we gave our best effort. 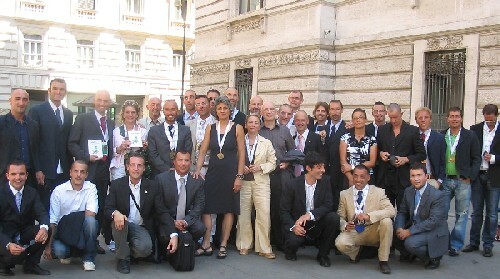 Last August 5th, a delegation of about 40 athletes, medalists at the EuroGames Barcelona 08, were received for the first time by Gianfranco Fini, President of the Italian House of Representatives, and leader of the most right wing party in the current center-right Italian government. The reception was requested by Anna Paola Concia, congresswoman for the Democratic Party and gold medalist herself in the tennis tournament of the EuroGames, and saw the participation of Pepe García Vásquez, co-president of the EGLSF. 2007 / © EuroGames 2008 BCN, S.L.